HE did not go to any school or college, but was well-versed in various Indian languages, including Hindi, Braj Bhasha, Sanskrit, Urdu, Persian, English and of course, Punjabi. He was seeped in the Sikh lore and wrote the first definitive encyclopaedia in Punjabi, the Gurshabad Ratnakar Mahankosh, one of the earliest works of its kind. Bhai Kahan Singh of Nabha was, indeed, one of the towering intellects of the 19th century, whose writings and actions left a deep impact on the region and the religion he belonged to. His imprint is to be seen in the literature he produced, as well as the actions of his student, Maharaja Ripudaman Singh of Nabha, who lead the reform movement among the Sikhs, sponsored the Anand Marriage Act and steered the legislation for the management of the Sikh Gurdwaras, which eventually lead to the formation of the SGPC. Baba Narayan Singh, Bhai Kahan Singh’s father, was a landowner and a deeply religious man. Bhai Kahan Singh studied at home and then went to Delhi and to Lahore in 1883. Upon his return to Nabha, he served the Nabha State and in 1887 was appointed tutor to Tikka Ripudaman Singh, the heir apparent. 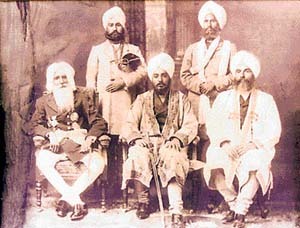 Bhai Kahan Singh was given several administrative and judicial positions, such as the Maharaja’s private secretary and a judge of the High Court. He also, served briefly in Patiala. He travelled to England thrice (in 1907, 1908 and 1909) to supervise legal matters for the Nabha State. Eventually, he resigned and devoted most of his time to writing. A typical day in his life started very early, when, after prayers, he went for a long walk. After breakfast he would work till noon. A short siesta, and he worked again until late afternoon, then attending to visitors from various walks of life. He spent 14 long years writing the Mahan Kosh which is a clear, succinct and wonderful exposition of the history, religion, culture and literature of the Punjab and the Sikhs. This reference book was published through the patronage of the Maharaja Bhupendra Singh of Patiala and is a standard reference text, still in print. It is considered an authentic interpretation of Sikh ethos. An important facet of Bhai Kahan Singh’s life is his association with Max Arthur Macauliffe, who he met by fortuitous chance in 1885 in Rawalpindi. Bhai Kahan Singh explained the Guru Granth Sahib to the Englishman and also helped him with the research of his work, The Sikh Religion, which was published in six volumes by the prestigious Clarendon Press, an imprint of Oxford Press, in UK in 1907. Bhai Kahan Singh contributed to the book in various ways, and even accompanied Macauliffe to England. The author later transferred the copyright of his book to Bhai Kahan Singh. Overall, the social situation in Punjab at that time was one in which excesses of the ruling classes had lead to decay in moral values. 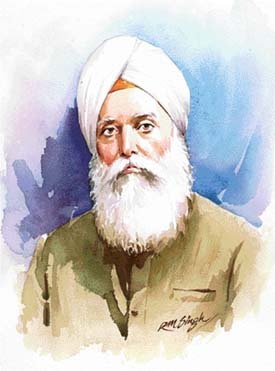 He and other reformers sought to reaffirm the uniqueness of the Sikh thought and it was in this spirit that Ham Hindu Nahin, a short booklet, was written in 1898. The title was provocative and it brought about quite a reaction, so much so that Bhai Kahan Singh eventually submitted a translation of the book in English to the British officials to clear the air. Bhai Kahan Singh practiced what he preached. He advocated inter-caste marriages and his son’s marriage was such. His niece, a widow, was remarried, in accordance with his wishes. Overall, he lived the life of an erudite country squire. He lived in Nabha, where his great-grandson, Major A P Singh, resides now. He would retire to the hills of Solan and Simla in summers, and was also known as a good tennis player. He contributed financially and otherwise to the Khalsa College, Amritsar, and presided over the Sikh Educational Conference in 1931, a singular honour. In 1932, the British government gave him the title of Sardar Bahadur. In 1933, he was presented a sword by King Nadir Shah of Afghanistan, where he had gone for research. Bhai Kahan Singh passed away on November 23, 1938, leving behind a rich legacy. Many generations have passed, but this extraordinary scholar still lives through his works. This article was printed in The Tribune, Spectrum on November 21, 2004.